Home › Latest News › Battle of the Kings 3: H-D® Tyger Valley's Entry! 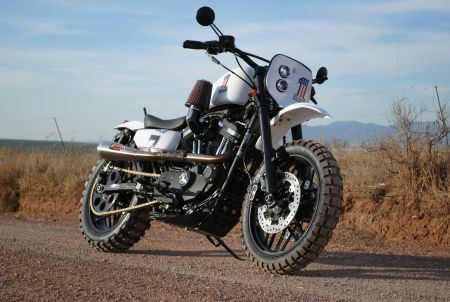 Battle of the Kings 3: H-D® Tyger Valley's Entry! South Africa is the highest off-road motorcycle seller in the world! With our world-class scenic routes, it’s no wonder. In an attempt to break the mold and prove that Harley-Davidson® motorcycles can be customised to suit just about any need, we decided to build a scrambler for our Battle of the Kings 3 entry. rather that it would be able to carry its new owner through all sorts of terrain and weather without hassle. exhaust with performance upgrades, dual purpose tyres, off road front & rear fenders plus much more! We also incorporated a chain conversion to bring the bike closer to theme. parts such as the indicators, front number board adapted to accommodate the headlights, wider handle bars for better maneuverability. motorcycle stands out like no other. For those wondering, this beautifully customised 1200 Roadster™ is fully road legal and sure to turn heads! Once again, our Custom King is Nicol Basson, who also built our last successful BOTK entry bike!